On top of that, this woman needed to supply her own sheets and pillow as well as any food she would consume while in the hospital. She arrived in a hurry to the hospital and therefore had none of these things with her. Sr. Rose came to her rescue though, with money and the promise of a pillow and sheets. When Sr. Rose came home she told us all this had to be put in place once the woman presented at the hospital despite the fact that the staff had made no diagnosis as to what was ailing the woman as they would not do any tests until the following morning. 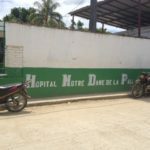 No wonder sick people avoid the hospital if at all possible, but in this case the kind and reliable director had decided to transport the woman the 45 minute drive into Jean Rabel’s hospital on the back of a motorbike, the most common form of transport in the area. This journey is a tough one even for someone like me in the whole of their health, and on Tuesday we had not even been able to attempt to travel to school as we had had quite a lot of rain and the river we had to pass was deemed impassable that morning. In the afternoon though this woman had to endure the rocky, muddy hills and dales and the wide mouth of the river just before it enters the sea, on the back of a motorbike, when her feet, most likely, dangled well into the water as they waded through the river on the motorbike and then tolerate the bike sliding and skating through the muck and the dirt on the other side as it made its way into the nearby village before heading up the steep, unstable, windy, rock road that takes you to Jean Rabel. When I’m in the car being driven this route, I have to hold on to all handles and supports available as we rattle and shake our way this way and that around corners and bends throughout the long journey. How this woman persevered throughout the same journey as a bike passenger is simply beyond me! Thank God though she wasn’t quite as bad as Sr. Rose had expected. She was put on a drip to be rehydrated and the following day her test results showed she was suffering from Typhoid and had a stomach ulcer. But at least she appears to be on the mend now despite her ordeal earlier on. 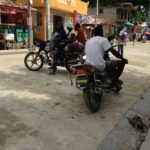 Life in Haiti is never easy but when sick or injured it can be much like hell on earth!